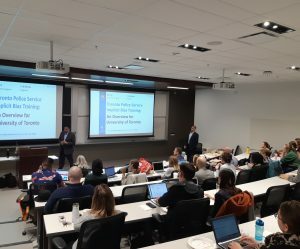 On October 18th, 2018 two Toronto Police Service (TPS) Sergeants came to the University of Toronto law school to present about the comprehensive training police officers go through to reduce their implicit biases on the job. The presenters were engaging, introspective and candid about the mistakes Toronto Police has made in the past. They also agreed that policing is a profession that cannot afford “bad apples”. The Sergeants’ explanation of the Police and Community Engagement Review (PACER) conducted by the Toronto Police Service beginning in 2012 was indicative of the TPS’s desire to address past issues with implicit bias. The PACER report made extensive recommendations, one of which was implementing the Fair and Impartial Policing (FIP) program, a bias mitigation program developed by a notable expert on bias in policing, Dr. Lorie Fridell of the University of South Florida. The FIP program is based on the modern science of bias, consistent with the TPS’s current focus on evidence-based policing and policy development. All new and existing officers go through the Fair and Impartial Policing program, which focuses on understanding human bias, the science of bias, the impact of bias policing, managing implicit bias, and addressing the biases of others. The Toronto Police Service’s implementation of the program has been successful enough to warrant an invitation from the program creators to help tweak it further. Despite the presenters’ extensive insight and understanding of the dangers implicit bias poses in law enforcement, the Sergeants prefaced their talk by stating that they were not going to talk about cannabis. This left me a bit dumbstruck, especially after having attended the “Perspectives on Cannabis” panel discussion presented as part of the law school’s Emerging Issues workshop series the week before. The panelists there, criminal lawyer Stephanie DiGiuseppe, sociologist Dr. Akwasi Owusu-Bempa and our own Professor Kent Roach, were explicit about the negative impacts of Canada’s cannabis prohibition on racialized and Indigenous communities. They emphasized the long-lasting and adverse effects on the lives of those affected by the biased and discriminatory policing of cannabis. In light of these realities, how could you not discuss cannabis at an implicit bias in policing presentation on the day after federal legalization of cannabis? Ironically, the Cannabis Act has actually created more laws around cannabis than existed before. Under the Controlled Drugs and Substances Act there were eight cannabis-related offences, including possession, trafficking, exporting, and importing. The Cannabis Act has both increased the number of possible offences, and made the penalties stiffer. These offences include, but are not limited to, public possession of more than an ounce, unauthorized promotion, and sharing cannabis with a minor. Sharing with a minor has a potential 14 year jail term attached to it, promoting to youth can get you a $5 million fine, and possession over the limit can still mean 5 years in jail. The Act has also created a category of “illicit cannabis,” which includes any products not purchased from an authorized retailer or grown legally. While adults are able to recreationally use cannabis, they are only able to do so within this strict web of regulations. I was hoping to hear about the TPS’s plan to reduce their implicit biases in enforcing the new Cannabis Act regulatory scheme. The vagueness and confusion about what legalization practically looks like has raised concerns about the potential for old habits of discriminatory law enforcement to persist. These concerns are amplified in light of the fact that uncertainty about legal cannabis consumption leaves a lot to the discretion of individual police officers. An obvious example is the fact that no standardized test has been accepted for determining whether someone is driving impaired. How will police officers ensure that they are not making decisions about impairment based on their implicit biases? Ambiguity also exists about where cannabis can be used, how minors will be identified, how illicit cannabis will be recognized, how immigration status will be affected etc. All this means is that the implementation of the Cannabis Act can very easily continue to disproportionately affect historically marginalized demographics. It is entirely unrealistic to assume that the biases that led to the over-representation of racialized and Indigenous Canadians with criminal records for cannabis-related offences disappeared as the clock struck midnight on October 17. In fact, research from other jurisdictions that have legalized cannabis has shown a decrease in overall cannabis-related arrests, but no decrease in the gap between racialized and white arrests. The reality of the situation is that an annual training is likely not going to undo a lifetime of preconceived notions and understandings of the world. It is also not going to erase the decades of friction cannabis prohibition has caused between the police and marginalized groups in Toronto. These concerns are not meant to criticize the TPS Sergeants’ presentation specifically. The TPS’s vision, as articulated in its PACER report, is making the Toronto Police Service a leader in bias-free police service delivery and their dedicated implementation of the Fair and Impartial Policing program is an excellent first step in doing this. The candour of the two presenters also suggested a genuine desire to improve the relationship between the TPS and the city. However, the anti-bias program described lacks the accountability and enforcement mechanisms required to make it effective in changing attitudes and behaviours. While it was a good presentation to give a room of privileged law students, I am not sure how it would resonate in neighbourhoods that have been adversely affected by biased police practices. A city as diverse and complex as Toronto needs a police service that represents, respects and protects all of its residents and can in turn be held accountable by them. As the city adjusts to the legalization of cannabis and all the regulations that come with it, the TPS is presented with an excellent opportunity to prove its commitment to reducing biases in policing. Toronto can lead by example and demonstrate that it is possible to police cannabis legalization in a just and equitable manner. Doing so will require widespread education about the new cannabis regulations, robust accountability mechanisms for law enforcement officers, an open dialogue between historically marginalized communities and the TPS and a demonstrated and genuine desire by the police to atone for past injustices. This entry was posted in Asper Centre students, Commentary, Legislation. Bookmark the permalink.